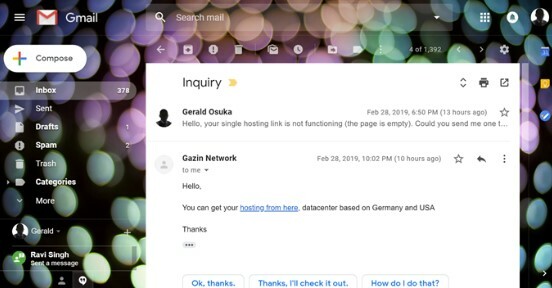 Gazin Review 2019: Is Gazin a Good Hosting? Germany-based company Gazin Host offers hosting, web development, and mobile app development services to a network of international and local customers. Since its establishment in 2014, Gazin Host has continually provided website and mobile application hosting services to both regional and international customers. Although the company hasn’t been around for very long, they’ve got a satisfied customer base of 3200+. Gazin Host is headquartered in Frankfurt, Germany, and has servers located in the U.S. and Germany. The company’s website, services, and support are provided in English, though this does not appear to be the team’s native language. It’s quite evident that if you choose to work with Gazin Host, your website won’t be running short on storage space any time soon. The entry-level plan comes with a generous 100GB storage space, while all other plans feature unlimited storage. This is not bad for a start, even though Gazin Host doesn’t use SSDs. With the entry-level plan, you will also get a free domain, but only if you sign up for an annual contract. On the other hand, Gazin Host’s highest-tier plan will get you up to five free domains — which is far more than most hosts will offer. Unfortunately, Gazin Host isn’t beginner-friendly. The platform doesn’t feature any easy-to-use tools or handy services such as a drag-and-drop website builder, user-friendly control panels, one-click installer, SSL certificates, or even free website migrations. Therefore, maintaining a website, installing applications, and running any updates might become a cumbersome task if you don’t have any prior technical expertise. Gazin Host doesn’t provide a lot of information on its web hosting packages. I also find the packages to be quite expensive. However, if you consider that you’ll be getting a lot of storage space and unlimited bandwidth, then it might just be worth the rates you’ll be paying. Although Gazin Host doesn’t provide SSL certificates or free website migration services, it’s good to see that the company offers a 30-day money-back guarantee as well as discounts of up to 30% on hosting and domains. It’s also a huge plus that you get a free domain with Gazin Host’s entry-level plan, even though this can only host a single website. Gazin Host’s plans come with annual billing terms and only allow for payments through PayPal. Since there aren’t any longer billing cycles offered, you won’t get any discounts even if you plan to sign up for a longer contract. I find these options (or lack thereof) to be rather limiting given that Gazin Host has an international client base. Gazin Host has a knowledge base, but this is empty and can’t help you. Plus, the company advertises a lifetime support guarantee, but actually only provides support through emails and tickets. To test Gazin Host’s lifetime support guarantee, I decided to submit my questions via email, raising my concern that the web hosting plan pages were down (these later came back online). I was skeptical that they would even read my email. Guess what? An agent responded to all of my questions in just three hours. Gazin Host isn’t your ordinary beginner-friendly web hosting provider, but it does offer a generous amount of storage and bandwidth — albeit at a rather high price point. Wondering how Gazin stacks up against other Web Hosting companies? Enter any other Web Hosting company and we will give you a side-by-side comparison.